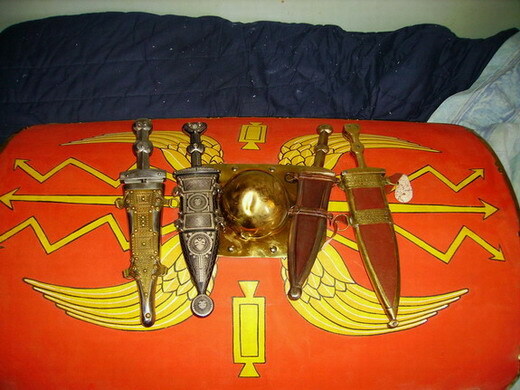 Forum Index > Historical Arms Talk > Show us your pugio/pugiones! Posted: Sat 14 Aug, 2010 2:09 pm Post subject: Show us your pugio/pugiones! Someone had to ask, may as well be me... show off your Roman-style short Caesar-Stabbers! Second pic: Don't know who made it. I lucked into it on eBay. Rarely will I buy something off eBay unless I'm sure of it's provinance; I forsook my own advice and took a risk -- and it paid off well, I'd say. 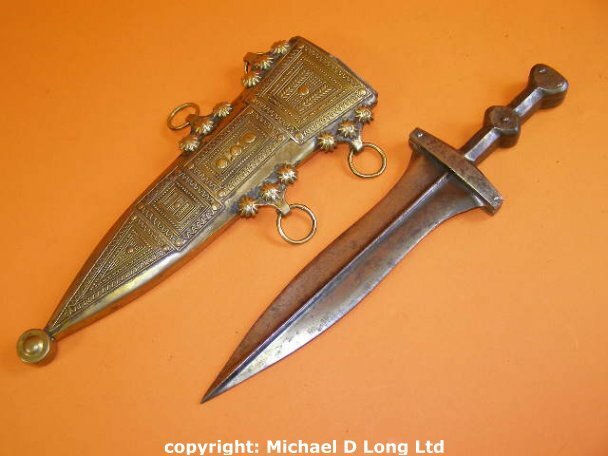 Despite being heavily patinated (not a bad thing, IMO), it "feels" right and looks to be highly accurate, including the scabbard (the "embossed" decorative plates seem to be brazed, not riveted as on the Deepeeka. This is a more accurate method of construction. Plus the scabbard is lined with wood covered in leather, and is not just metal). I have a feeling this was used by a British Roman reenactment group (Ermine Street Gaurd, perhaps? There are several Roman groups in the UK).